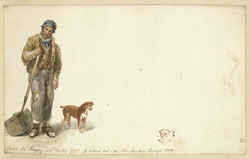 This portrait of "Old Murphy" and his faithful companion was created at the time of the construction of "New London Bridge" in 1830. A bridge has spanned the Thames at this location for nearly 2000 years. An unknown number of timber bridges were built by the Romans, by the Anglo-Saxons, and after the Norman Conquest. The first stone bridge began to appear in 1176 following the orders of Henry II, and was completed thirty years later in the reign of King John. It remained the only bridge to exist in the capital until Westminster Bridge appeared in 1750. The structure of London Bridge was spectacular in that it was lined with houses, shops and chapels. It was customary to decorate the site from time to time with the heads of traitors placed on spikes. "Old London Bridge" stood until it was replaced by "New London Bridge", which was designed and built by John Rennie between 1825 and 1831. This masterpiece of 19th century engineering was itself replaced by the present structure, opened in 1973.